Soldier, Spy, the eagerly anticipated follow-up to Rifleman, is the story of a soldier returning to civilian life and all the challenges it entails. Facing a new and ever-changing London, a shifting political landscape and plenty of opportunities to make a few bob, repairing the bomb damage and doing construction work on the Festival of Britain site, Vic moves from one job and pastime to the next, becoming by turns cyclist, builder, decorator, trade union official, Communist Party member and long-distance lorry driver. Finally he is offered 'a nice clean job' as chauffeur to the chairman of the Moscow Narodny Bank in which he will be able to return home to his wife and children every night. However, there is more to his new employers than meets the eye, and it is not long before his wartime work with the Long Range Desert group catches up with him in the form of an approach from the security services. Lured by the excitement his postwar life has lacked, Vic adds spy to his roster of employments, risking everything in the process. 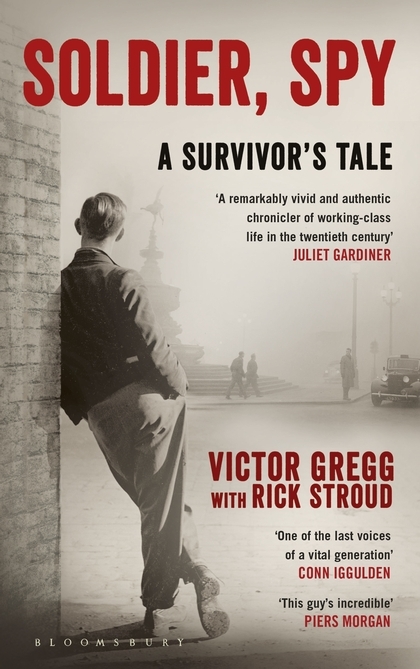 Beginning in 1946, when Victor Gregg was demobbed after the end of the Second World War and deposited in London Paddington, Soldier, Spy is the story of a soldier returning to civilian life and all the challenges it entails. I remember one day during the Battle of Alamein when my friend Frankie Batt, a man I had enlisted with way back in 1937, was blown to pieces. I recall trying in vain to put the bits together, to somehow bring Frankie back to life. As I picked up what was left of him I could feel the hate burning inside me. Accounts would have to be settled. For the next three or four weeks our section of three carriers never brought a single prisoner back to the lines, despite the fact that the battle was nearly over and the enemy were coming forward in their hundreds with their arms raised in surrender. So long as no officer or senior non-comm. was witness we shot as many as we could until our anger died its own death. Friends and well-wishers have told me over the years that I have nothing to feel guilty about and that me and my mates were only doing our duty. Even now, all these years later, I’m not so sure. I fought in the Second World War from its start in 1939 to its fiery ending in May 1945 when I emerged from the ruins of the beautiful city of Dresden with my mind and body scarred. I witnessed things that I had not thought possible and my brain was filled with images of suffering that were to haunt me for the next forty years. But for now the fighting was all over and the final gift from a grateful country was a civilian suit, a train ticket home and, if I remember correctly, about £100 of back-service pay. Today we are called heroes but back then we got the impression that we returning servicemen were a necessary evil. For six years I had lived in a world where killing was both taught and encouraged. In this new post-war world it seemed to me that even a frown could get me in front of a magistrate on a charge of ‘disturbing the peace’. I had started out like all my comrades, soldiers, sailors and airmen, with a laugh and a song and finished up a prisoner of war in the ashes and rubble of Dresden, surrounded by pyres of burnt bodies. The events of the night of 13 February 1945 and the days that followed changed me more than anything that I had seen in all of the rest of the war. I thought that the people who were in charge, the masterminds behind the fire-bombing of the city, were tarred with the same evil brush as the enemy. Soldier, Spy is available to preorder on the Bloomsbury website, and is due to be released on 5 November 2015.